A bumpin’ soundtrack, motivating instructors and isometric movements are the names of the game at Pure Barre. Ballet basics give a modern twist to tone your arms, abs, booty, legs and more. Grab your barre socks and get ready to sweat! There’s always a hip, exciting new art opening happening at this Westside arts hub and event space. Pro tip: It hosts a monthly salsa dancing night followed by a tequila sampling and finger-food buffet, if that’s more your speed. Dark, flattering lighting, boozy craft cocktails and plenty of seating that allows for getting up close and personal— there’s little not to love about this Westside gem. Split the calamari, knock back some sake and see what happens. 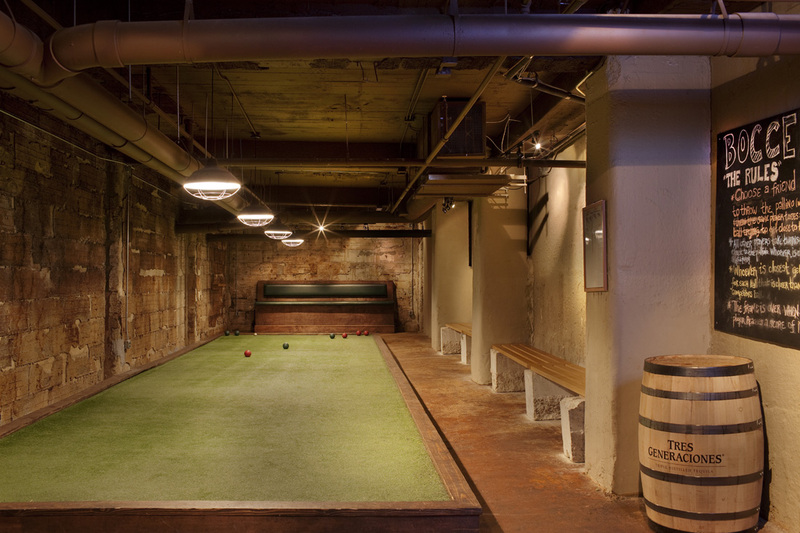 Get your bocce game on at Ormsby’s on the Westside. The upstairs bar and seating area of this Westside hidden gem can get crowded. When that happens, feel free to venture downstairs to try your hand at the wide-ranging game offerings, including backgammon, bocce ball, pool, shuffleboard, darts and more. It’s a great way to show off to pals or a date—until that last drink kicks in, at least. A beloved local craft brewery since it opened its doors a few years back, Monday Night’s hip space lets your bevy of friends imbibe inside or out. Sample a slew of signature suds, such as Fu Manbrew (a Belgian-style wit), Drafty Kilt (a Scotch ale) and Nerd Alert (a pseudo pilsner). Each beer is crafted to be paired well with a variety of foods—enjoy the Blind Pirate Blood Orange IPA with strong cheeses, citrus and spicy foods, or opt for the Eye Patch Ale and a burger or fish. Guests are free to rent the space for private events of two to 30 people, with full access to Monday Night’s lounge, parlor and conference room, a private bartender (and pint glass and six tickets for each guest), and use of television and A/V equipment. If you prefer something more casual, the brewery hosts public tours and tastings on Mondays, Tuesdays, Thursdays and Saturdays, excluding holidays—$12 lets you snag a tour of the brewery (including its bottling line that puts out a whopping 3,000 bottles per hour), a souvenir pint glass and six 6-ounce beer samples. It may claim to be in West Midtown, but this beachy, upscale street food eatery is Westside all the way. Bartaco’s kitchen stays open “late” (hours vary) daily, so Lyft over post-bar hopping for a small tray of fresh baja fish tacos with chipotle slaw, a mushroom mole tamale or a steamy pork belly rice bowl.